Today’s recipe is perfect for the holidays. 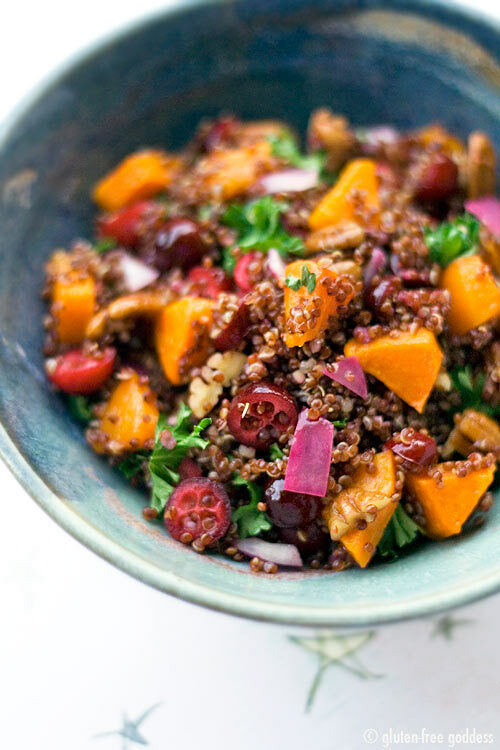 It’s a beautiful, lipsmackingly yummy quinoa recipe featuring roasted butternut squash, cranberries and pecans. A fresh and eye catching dish to grace your Christmas Eve table. Or your Christmas Day buffet. Or your New Year’s Eve shindig. You name it. Serve as a colorful vegan main dish – or a side dish. Or stuff a vegetable (it would be fab and hip served in roasted bell pepper halves, or roasted acorn squash). Note: Red quinoa has a milder taste than the standard quinoa. So if you think you don’t like quinoa, try the Inca red. I suspect you’ll convert to quinoa love.